The Waterford Institute of Technology (WIT) GAA club in conjunction with Whitfield hosted a sports forum on Wednesday 29th of November at 6pm, in the WIT Arena. The aim was to open the debate on all aspects of recovery for an athlete; from injury, operation, rehabilitation, to player health and well-being and facing up to the challenges of combining all of this with day to day demands and the demands of returning to the field of play. The all-encompassing nature of the topics open for discussion was reflected in the event title “Injury Management and the Road to Recovery”. The organisers amassed some very interesting guests who deal with injuries, the recovery and from a variety of different personal injuries. The forum was hosted and organised by WIT GAA club and sponsored by Whitfield, the renowned provider of patient care and high standard for clinical excellence in various fields including GAA. The event focused on athlete injury and the challenge of managing and dealing with the recovery experience. Master of Ceremonies for the event was WLR FM’s Eamon Keane. Contributors and members of the panel included: Mr Pat Carton; Orthopaedic Surgeon (Hip & Knee); Mr Shane Walsh; physiotherapist; Mr Pauric Mahony, former WIT Business Student & current Waterford hurler, Mr William Maher, current WIT Executive MBA and GPA Scholarship Student and former Tipperary hurler; Ms Mairead Daly; Current MBS Marketing and WGPA Scholarship Student and current Offaly Ladies footballer; Dr Ciara Losty; Lecturer in Applied Sport and Exercise Psychology, at WIT’s Department of Sport and Exercise Science. On the night, Offaly native Mairead Daly spoke out about how she felt and dealt with sustaining the dreaded cruciate ligament injury back in 2013 along with breaking her collar bone last year. While both injuries are different in nature one thing that stood out to her on her road to recovery was while she was still involved in some capacity with her club, St. Rynaghs and Offaly, things were different. The talented ‘Dalo’ as she is called in WIT, reflected and highlighted that in a way her sense of identity was lost while she was injured. However, such an injury has certainly not stopped Mairead. Her performance with this year’s successful Lynch Cup winning WIT team was top class, and such efforts were highlighted when she received a Higher Education College All Star. With such a team being dominated with tier 1 teams, Mairead being selected from a 3rd tier team was without doubt a major achievement. Not only this, the young Offaly woman was then awarded with WIT Sports Star of the Year at the Club and Societies Awards night. Furthermore, the BBS in Recreation and Sport Management (Hons) student received the Department of Health, Sport and Exercise Science Female Sports Person of the Year 2017. Perhaps one of the biggest and most memorable honours to date for Mairead, was being awarded the Ladies Gaelic Football Player of the decade at the 2016 Offaly Sport Partnership’s Awards night, an award to which is definitely well deserved. This event was aimed at sports managers, team’s physios and physical therapists and athletes in sports to enable them to better manage the various challenges on the road to recovery. The Hip & Groin Clinic, based in Whitfield Waterford provides sportsmen and women with rapid, often next day, access to specialist consultants, who are experts in the diagnosis, management and treatment of hip and groin related pain or injury, including Hip Arthroscopy, with no delay to further investigations or surgery, if required. Mr. Pat Carton and the surgical team at the Hip and Groin Clinic are experts in their field and are supported by a dedicated orthopaedic nursing, administration and physiotherapy team at Whitfield, who work endlessly to provide the best quality of care at every stage of the patient’s treatment. 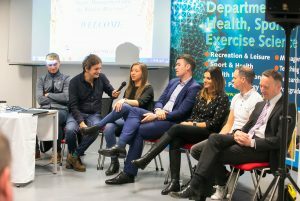 The event was also supported by WIT Department of Sport & Exercise Science, WIT Clubs & Societies, the WIT Arena, and the WIT Student’s Union. On the night many WIT students attended including WIT Sport Scholarship Students along with current and past WIT GAA Players and Students. Lots of WIT Staff members were present too. “The open panel nature of this forum and the mixture of guests that we assembled gave the audience several different views and opinions on the topic we chose. We were delighted that the audience took the opportunity to ask questions to the panel of guests on areas of interest to them, and with the fine turn out to what was a wonderful evening in WIT,” said Katie Redmond, WIT GAA Development Officer.